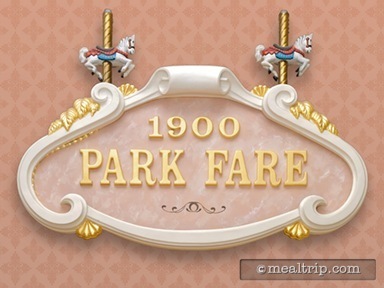 1900 Park Fare is the Grand Floridian’s character buffet location. At dinner time, Cinderella and Prince Charming are usually on-hand, along with a couple of step-sisters (although the actual character line-up can change from day to day). Cinderella’s name is on the billing, so she (at least) usually makes an appearance. The setting is somewhat turn-of the-century Victorian with decor items that include a late 1800s Limonaire French band organ and several wooded carved carousel horses. The actual seating, wall decorations and carpet are squarely from this century. The actual dinner buffet line is somewhat small but includes a few slightly elevated items from the popular Strawberry Soup, Verlasso Salmon, Butternut Squash Ravioli (seasonal), and even Mongolian Stir Fry. Child-friendly options include mac and cheese, chicken nuggets, pizza, and a few more options. Assorted bite-sized pastries that are made in-house are on the dessert buffet.